"One of Michigan's Finest RV Resorts!" When you come and visit us at Lighthouse Village RV Resort you will notice right away that you have stepped into the RV Resort experience of a lifetime. We pride ourselves on being your personal getaway from the hustle and bustle of daily life. Your family can participate in the many weekday and weekend activities offered at the resort. You never have to leave to have fun. Get ready for great fishing, beaches, sunbathing, swimming and great times with the family! Challenge your friends and family on the Miniature Golf Course, Tennis Courts and Shuffleboard Courts. Then, stop by for a dip in our large heated outdoor pool. Member of the Coast to Coast program? Use your Coast membership to spend a night or two at Lighthouse Village. We think you'll want to stay! 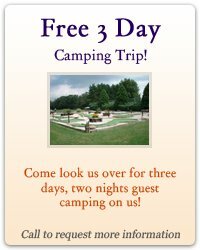 Bring your RV and park it on your own membership site. Most of our RV sites offer full hook-ups and some only offer water and electricity. We have some great sites around our lake and large pond. Own a Park Model or RV and have your home away from home. We have many models throughout the park including by the lake and ponds. The contents of this webpage are Copyright © 2019 Lighthouse Village RV Resort. All Rights Reserved.